PetArmor For Dogs provides the same #1 veterinarian-recommended active ingredient, fipronil, in the same concentration as Frontline Top Spot. You get the same flea and tick protection at a significant savings. PetArmor for Dogs acts fast. It is an effective, long lasting, waterproof, and easy-to-use application for killing fleas, ticks, and chewing lice on dogs and puppies eight weeks and older. 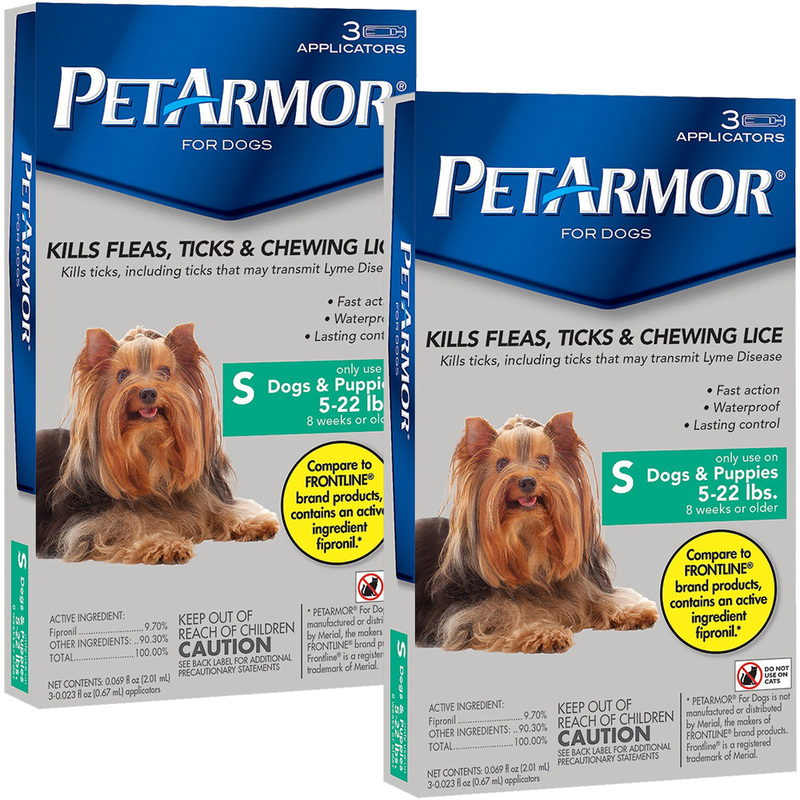 When used as directed, PetArmor for Dogs stops infestations of fleas, ticks and chewing lice. It also protects your pet from the mange mites that can cause severe skin allergies like scabies. PetArmor for Dogs acts fast and is effective, long lasting, waterproof, and easy to use for the control of adult fleas, ticks and chewing lice on dogs and puppies. Used as directed, it can help prevent reinfestation while also controlling sarcoptic mange infestations. PetArmor for Dogs kills, controls and prevents infestations of adult fleas (prior to egg laying), brown dog ticks, American dog ticks, lone star ticks and deer ticks (that may transmit Lyme disease), as well as chewing lice. Fleas- According to reasearch studies, adult fleas are killed for up to three months following an application of fipronil. If, however, your dog or puppy is susceptible to flea allergy dermatitis, or if you believe there is a risk of reinfestation, apply every month. Ticks- Each application kills ticks for one month or longer. For best control of ticks, apply once every month. Chewing Lice- Each application kills chewing lice for one month or longer. For best control of chewing lice, apply once every month. Invert tube over dog and use open end to part your dog's hair. Squeeze tbe firmly to apply all of the solution to the dog's skin as a spot to the dog's back between the shoulder blades. Did the ingredients in PetArmor® for Dogs or PetArmor® for Cats change? No, the ingredients in PetArmor for Dogs or Cats did not change. This product still contains the #1 veterinarian-recommended active ingredient, firponil, at the same amounts. Is it normal to still see fleas and ticks on my pet a few days after treating it with PetArmor? Yes. After treatment with fipronil, fleas and ticks get very active as they die and move to the top of the pet’s coat where they are more visible. This is actually a sign that the product is working. However, if you’re seeing fleas several days or weeks after applying PetArmor, you may have an infestation in your yard or elsewhere. Remember to treat all pets in your house with PetArmor every 30 days throughout the year to help protect your pets from fleas and ticks. Can I use PetArmor more than once in a month if my pet has a really bad flea or tick problem? No. PetArmor should not be used more than once every 30 days. If you have a bad infestation, talk to your veterinarian about your options. Does your product have an expiration date? What is the shelf life of the product? This product has a shelf life of three to five years. When properly stored and under ideal conditions it will be five years. If there has been a variance in temperature (extreme heat for example), it may reduce the effectiveness of the product. Be sure to store the product in a cool (below 77°F/25°C) dry place inaccessible to children and pets. Do not refrigerate and protect from direct sunlight.